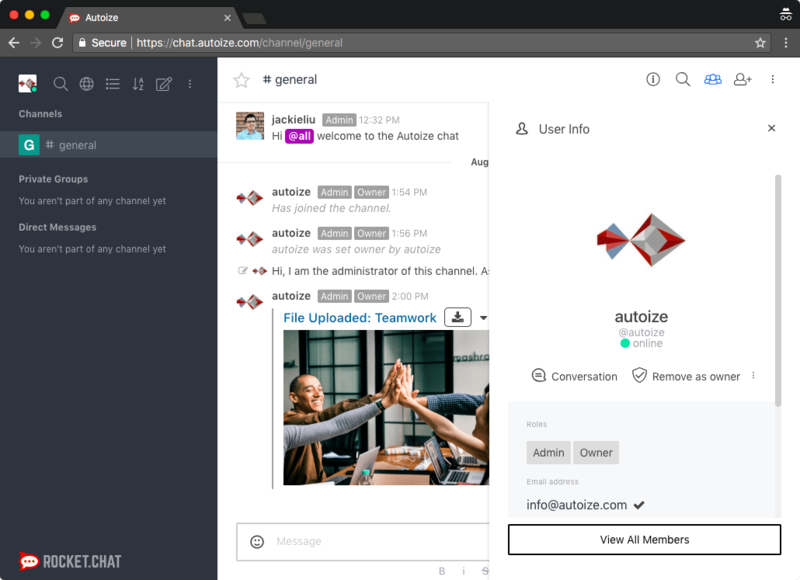 RocketChat is the leading open-source chat & collaboration tool for your team or community. Most team chat apps such as Slack are hosted by a third-party provider, as a software-as-a-service. RocketChat can be hosted in any cloud or on-premise environment, giving you unparalleled control over your data. Beware of freemium solutions that limit the number of users or chat messages you can retain. Once you’re locked in to a Slack or Microsoft Teams workspace, it can be tough to convince your team to migrate everything over to a new application, despite costs that can exceed $8,000/year for 100 users ($6.67/mo per user). Persists data between updates – when you recreate the containers, no data is lost. We charge a one-time flat fee for setting up RocketChat in your cloud provider – whether that be AWS, Azure, Google Cloud Platform, DigitalOcean, or Linode. After everything is setup, you pay only the cost of hosting which can be less than $100-150/month for up to 500 users. If you prefer to store your users’ data in a European country for reasons such as GDPR, many choices of datacenters are available. RocketChat has desktop clients for Windows, MacOS, and Linux, as well as mobile apps for iOS and Android. Your team or community will be able to stay in touch anywhere, with unlimited group chats, private chats, file uploads, and video conferencing. As the admin, you have full control over what information each user has access to, as well as the ability to add owners and moderators to each chatroom. We will also set up a SMTP email gateway to ensure your users can receive confirmation and password reset emails, something which is not included out of the box. Our RocketChat Docker stack can be easily scaled as your needs grow, by increasing the CPU/RAM on your existing instance, adding block storage, or scaling out to multiple backend servers.